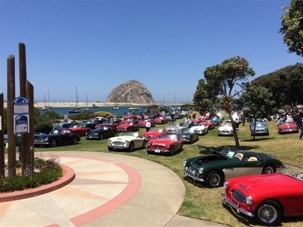 California Healey Week 2018 registration is now closed. If you have any questions, please contact Mike Scroggie at mscroggie@aol.com. Do to overwhelming response, we have reached the limit of the number of cars for the Car Show on Saturday, October 20th. You can still register for the week’s other events but we are reaching the limits of room availability and headcount that we can support. The absolute deadline for room reservations and CHW registration in September 19th. 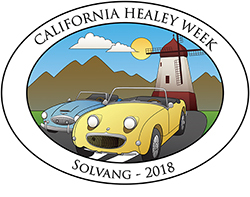 Get ready for great sports cars, food, wine tasting, friends and a beautiful location…California Healey Week 2018, hosted by the Austin Healey Association of Southern California, will be held in Solvang, California from Wednesday, October 17th to Sunday, October 21st, 2018. The event will be headquartered at the Hotel Corque in downtown Solvang, see www.hotelcorque.com. Registrations are now open for the event. 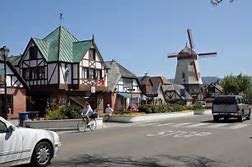 The historic Danish village of Solvang offers the best of the Santa Ynez Valley and Santa Barbara wine country in a relaxed and peaceful setting. Indulge in authentic Danish pastries at the world-famous bakeries. Stroll through the village and admire the old world European architecture, plus find the perfect souvenir at a variety of charming boutiques and shops. Fall is typically beautiful in the Santa Ynez Valley. We plan to have some beautiful drives through back roads in the Valley, with the option of visiting several of the many vineyards for wine tasting. 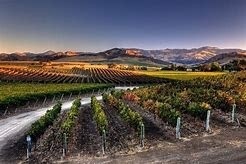 In addition to Solvang, we will visit Buellton, Los Olives and other locations in the valley. 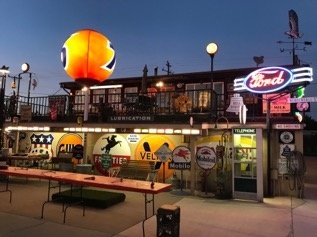 We also plan a visit to the Mendenhall’s Museum, which is one of the largest collections on the west coast of gasoline pumps, petroliana, road signs, license plates, race cars, racing history, miscellaneous antiques. You will be able to roam through their extensive displays of automobile antiques and collectables, with an extensive history of auto racing, especially the pursuit of the 200 MPH records at Bonneville. 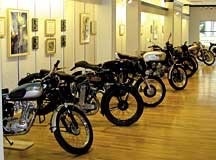 You will have the option to visit the Vintage Motorcycle Museum in town. The collection is quite broad with something for everyone, ranging from the very early to the present, and across all makes, including: AJS, BMW, Ducati, Gilera, Matchless, Moto Guzzi, MV, Norton, Triumph, Velocette and Vincent. Rocker Cover Racing is always a highlight at California Healey Week. 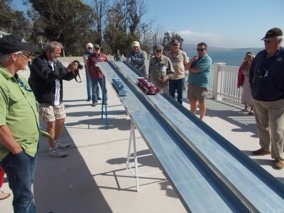 This event entails participants racing rocker (valve) covers, adapted with wheels and decorations, down an inclined track. Awards are given for fastest racer and “best presentation”. This event is held during cocktail hour, to add levity! During CHW 2018, we will celebrate the 60th Anniversary of the Austin Healey Sprite, including a special tribute to this iconic British sports car. The highlight of California Healey Week is the car show on Saturday, October 20th. We are negotiating to have this at a great central location in town. There, you will see some of the most beautiful Austin Healey sports cars around. The show is organized by Healey model, type and year with public voting for awards in 8 classes. Many more activities are currently in the planning stages. You can either register online at www.austin-healey.org or by downloading a manual form. Hotel space is limited, so be sure to register soon to secure your place for this special Austin Healey event. Stay tuned to www.austin-healey.org for additional information and announcements.